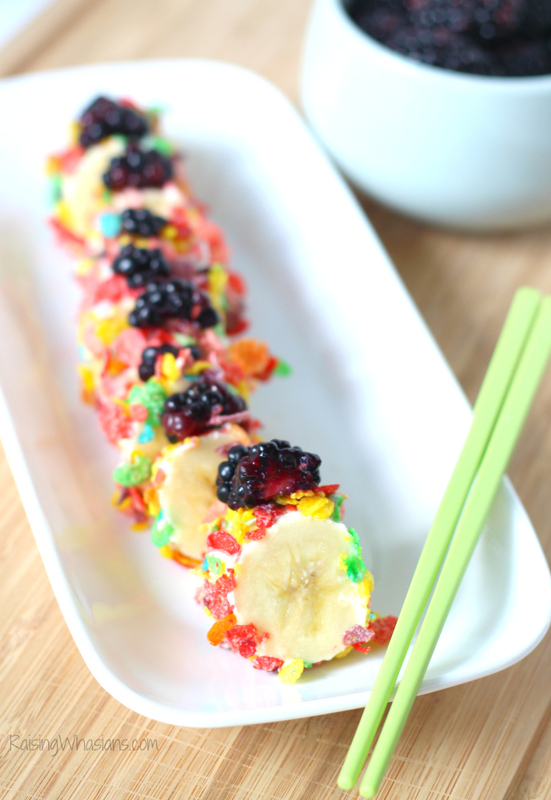 Make breakfast time FUN for your kids with this Kid Friendly Breakfast Sushi Recipe. This post is sponsored by Pebbles Cereal. All playtime opinions are my own. May contain commissioned links. Sushi lover? Yes, that’s me. I could eat sushi Every. Single. Day. Perhaps it’s in my genes, but just typing the word right now has me craving sushi. My kids on the other hand? Not a chance. All of the Legos and Disney Princesses in the world wouldn’t convince my picky eaters that sushi is one of the most delectable food groups. But then again, there’s always breakfast! 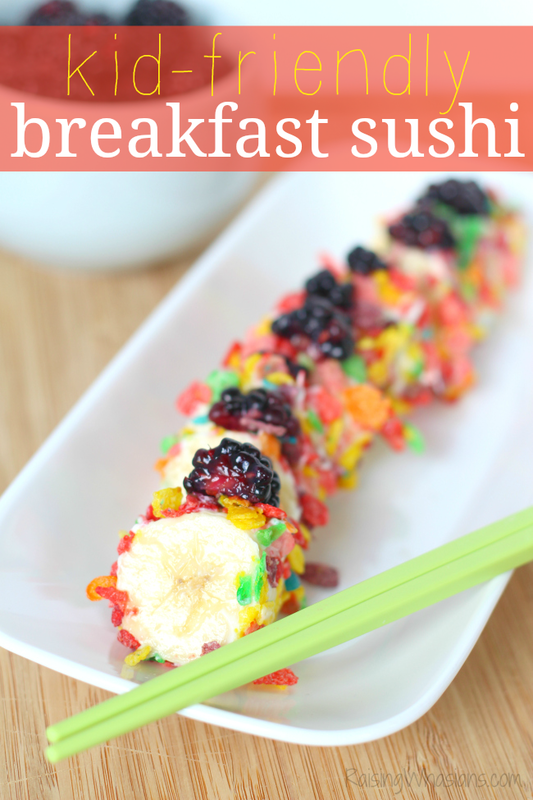 This Kid Friendly Breakfast Sushi Recipe is inspired by my two little picky eaters. 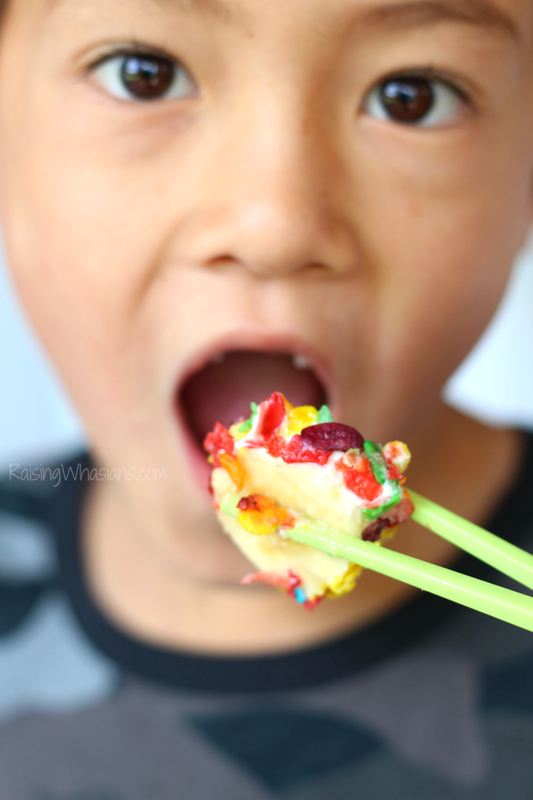 A little Asian influence, a delicious balance of kid-favorite breakfast foods, and a perfect way to have FUN in the morning, (Yikes! Is back-to-school on it’s way already?) these two couldn’t resist our play on sushi…for breakfast. GROAN, I’m already thinking about Back-to-School. Those hurried breakfast meals are a definite cause of stress in our mornings, especially with two grumpy kids. You know what I’m talking about. Making a breakfast that’s quick, easy, nutritious and FUN — it’s definitely a challenge. Hence, Kid Friendly Breakfast Sushi. Grab your kid-friendly teaching chopsticks! And F-U-N. It’s a breakfast that we all can agree on. 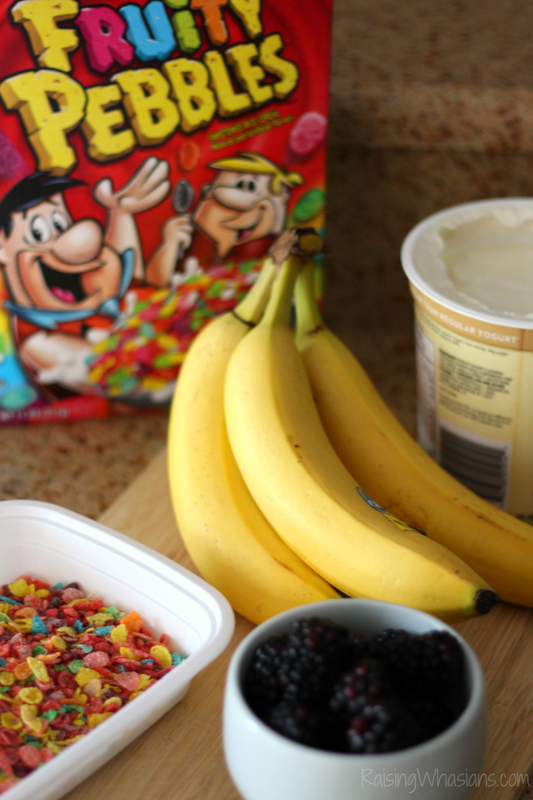 By mixing together fruit, yogurt and cereal in a playful way, my kids can gobble up the goodness in the morning. And bonus, I even get a smile out of these two early risers! Ready to create your own? Grab the easy recipe! Begin by peeling the banana. Using a butter knife, spread a layer of Greek yogurt on the outside surface of the banana. Place your Fruity Pebbles in a shallow dish. 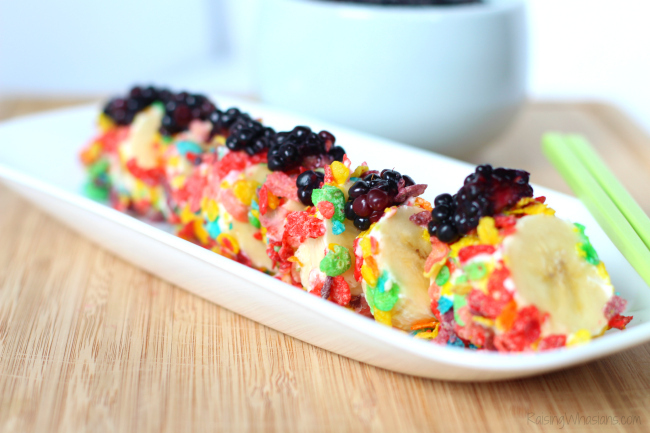 Roll your banana in the Fruity Pebbles, until fully coated. Place banana on a plate. Slice into "sushi" sized pieces. Arrange and top with blackberries. Need some more inspiration to “play” with your food? Check out this FUN activity and snack in one! 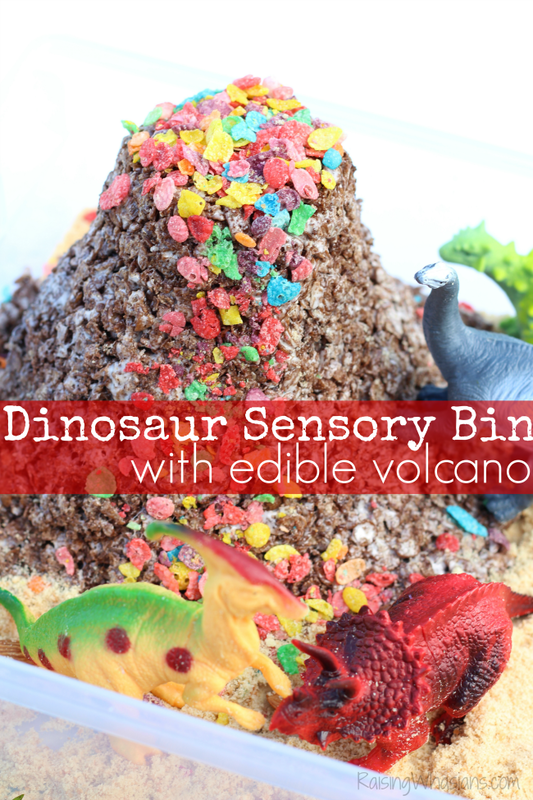 Make your own DIY Dinosaur Sensory Bin with Edible Volcano. How do you make breakfast time FUN for your kids? Be sure to follow Raising Whasians via Facebook, Twitter, Google, Instagram, Pinterest and YouTube for more of your favorite kid-friendly recipes, craft ideas, family travel & hilarious stories. That is the cutest idea ever. My kids will flip for this. Oh my. What a cute breakfast treat for kids! I have never thought of making sushi like this before, what a cute kid friendly recipe idea for breakfast. I love how it’s so colorful! What a fun recipe for kids! This is so cute and it looks tasty too. What a fun adventure for breakfast. I’m sure the kids would love it here! What a fun idea! I’m sure it’s a great way to get them to eat fruit too! Now this is a creative idea!! My kids would look at me like I was crazy if I tried this now but I wished I could’ve thought of something like this when they were younger. These are so adorable! What a great idea for a kid friendly breakfast! I think kids will like it! “Son, do you want a nice tasty sushi?” and there, he already munches on the bowl, though I kind of admit it’s a bad idea to steer them away from what a real sushi is but hey, regardless this one’s a good treat for them! My husband and I are also big sushi lovers! This recipe looks cute and tasty for children and a unique breakfast idea. My husband and I are also big sushi lovers. This looks like a creative breakfast idea for kids. I LOVE Fruity Pebbles so much! This is my kind of breakfast or snack! So fun! Breakfast sushi is our favorite, we usually use peanut butter. Love this idea!!! That is the most beautiful looking sushi I’ve seen. I think I need to make this for a party, darling. Your photos are gorgeous too! 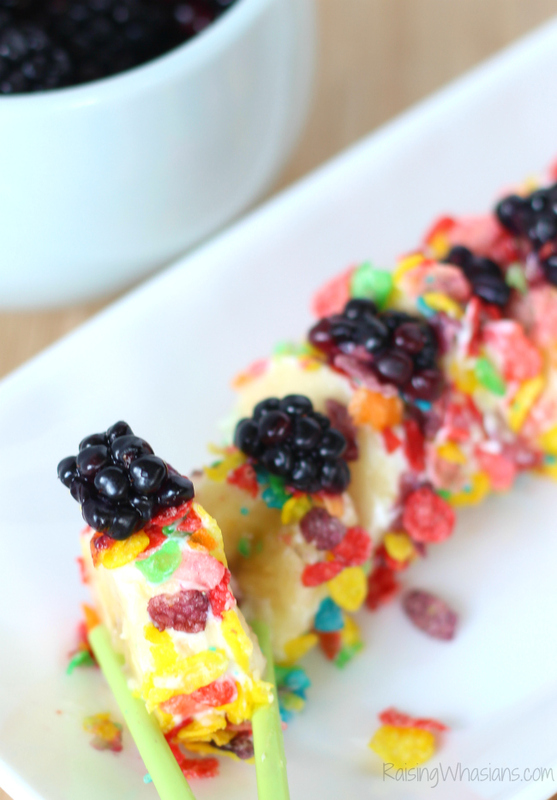 What a clever and fun breakfast recipe! My kids would really enjoy breakfast if I made these! This is so adorable! 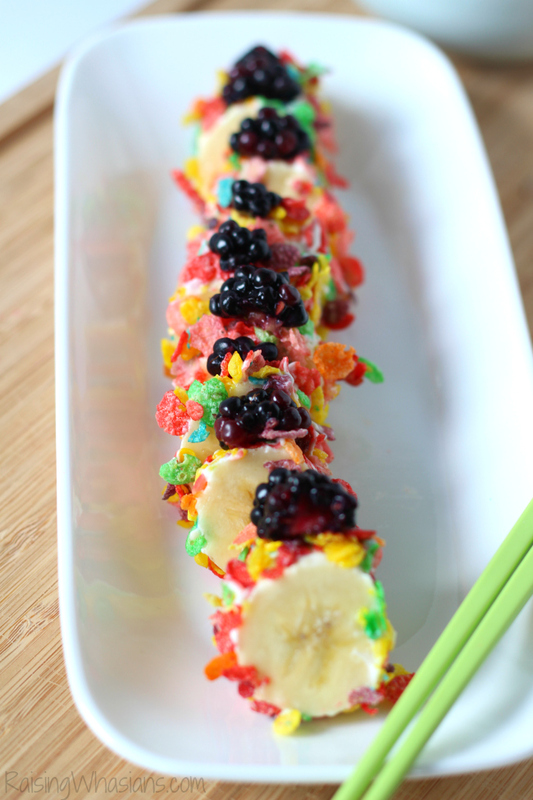 The kids are going to adore this fun twist on sushi. And I love that they’ll start the day with cereal, yogurt & fruit. What a fun idea! It does look delicious! I love this idea! I have made PB&J sushi with bread for my daughter many times, but this is so much more creative! My daughter would LOVE this!! Oh, wonderful idea! My son will surely love to eat this, look at all these colors! This is one of the cutest breakfast ideas for kids that I have ever seen. Even though my kids are grown and out of the house, I may just make this for myself because it looks fun and delicious. Awesome idea for kids breakfast. I must admit I kind of go brain dead trying to come up with something healthy for my grandchildren. This will be a hit! Thanks for sharing. fantadtic tecipe my son woulfd gobble this! This is such a super cute idea!! Only thing I would change was the cereal I would use. Cereal with less sugar would be my option or even a homemade granola that has a lower sugar count. You could use coconut shavings instead of cereal, too. I’m always s looking for healthier alternatives to sugar fill treats and cereals. I was thinking of using peanut butter and coconut for my kiddos. This is so creative and fun. Tasty for sure too! This will be fun to try especially the next time my daughter has friends over for a sleepover. Loved this idea! Saw on Pinterest and had to try. Didn’t have Pruity Pebbles but had COCOA Pebbles and still sooooooo delicious! I’m not a kid but I’ll eat kiddo sushi any day! It was fun and yummy. If we have a brunch with my girlfriends kids soon I’m making more! Great idea and super delicious, thank you! What a fun breakfast idea! This looks so delicious and kid-friendly! This would be a huge hit in my household. My grandsons would eat this up! My daughter would love that! Eating it with chopsticks would be the icing on the cake for her! You serious make the best recipes, especially for the little ones! 🙂 They are always so colorful, bright, and fun! I love this idea so much, if I had the ingredients I would make it right now! Thank you so much for sharing. I’m doing it! I’ve got a sushi loving 7th grader who would get a kick out of it and probably love it. Any chance to use her chopsticks. This would be an enjoyable creation for myself and the kids! This is not only cute but healthy. The kids will eat this like it is going out of style. This is a fabulous idea and so much fun and colorful too. I would enjoy making and eating this myself! I love this idea, looks good and gives a great meal for breakfast thanks for sharing. This is so brilliant, I’ll definitely be trying this with my kids. My youngest hates eating breakfast, so I’m looking forward to giving this a go. Although it might not be as good as my real local sushi restaurant Rofuto, I’m really happy you shared this with us. Thank you! 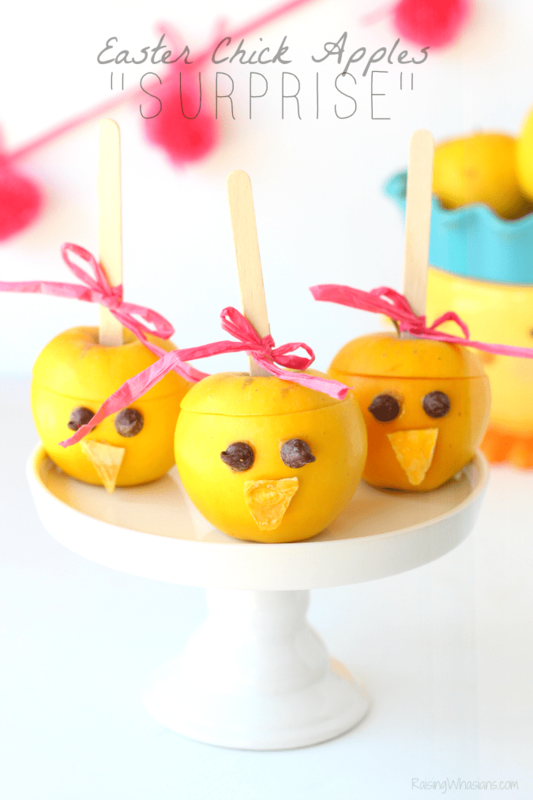 This is so cute and sure looks delish for little kids. It would be good for a party! Very cute and yummy idea, i would eat this! I love this idea! Sounds delicious! Hi! I love this idea so much! Thanks for sharing! One question, what type of Greek yogurt did you use? For this, I think I used Stonyfield for this one. I go for the vanilla flavored greek yogurt, since my kids like the taste better.